If you can play something on your TV, you can also play it on the go with your iPhone or iPad. Just log in to beIN Connect with your Digiturk account and take all the movies, TV shows, live TV channels and live sports events with you wherever you go. Watch the action live with more than 90 live TV channels. Did you miss a moment of the show? Or was traffic too heavy today? Live TV don’t have to be live. You can rewind the live broadcast up to 12 hours and watch any program on any channel as its live now. High quality action of top football, basketball and Formula 1 organizations. Watch any match of football (Premier League, La Liga, Italian Serie A, Ligue 1, Brazil Serie A, Turkish Super League), basketball (NBA, Turkish Airlines Euroleague, Turkish Basketball League) and Formula 1 organizations live in the app. Rule the schedule. Don’t let it rule you. Don’t ever feel the stress of catching the latest episode of your favorite TV show when its live. 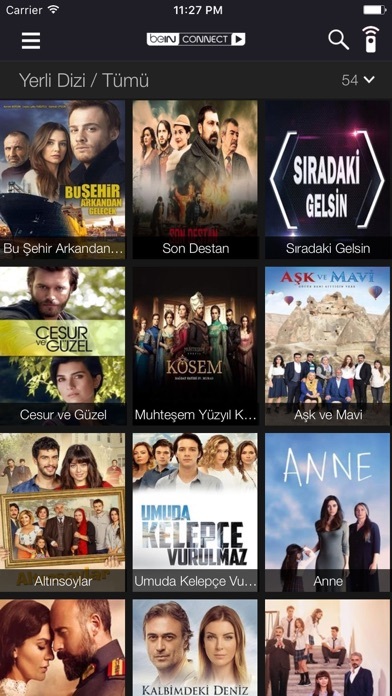 Watch any movie or TV show in Digiturk’s selection of on demand content. It’s added to the collection when it’s shown on any beIN Movies or beIN Series channels or a selected national TV channel. Pair your mobile device with your Digiturk set-top box and make it a companion for your TV. You can use it as a full featured remote controller or even send the movie or TV show playing on your phone or tablet to your TV screen and enjoy it on the big screen. Don’t ever bother trying to remember the last episode you’ve watched or the point you were when you’ve stopped the movie. beIN Connect keeps track of the things you watch to asist you getting back to where you were when you’ve left. © 2019 Karetra. All rights reserved.